This has got to be one of the easiest and quickest things I have ever made. Honestly, it's as easy to poor milk on cereal, only this requires just a modicum of extra stirring. It comes from a book that I was lucky enough to be sent the other week, Karen Bussen's Simple Stunning Parties at Home. It's one of those gorgeous full-color books, with plenty of tips for organizing beautiful and even economical (when you consider how much parties away from home can cost) get togethers. She includes sections of practical advice on stocking the pantry, being ready with drinks and creating a setting. Then gives you 12 party ideas, complete with theme and recipes. Unfortunately, my apartment is equipped to accommodate 4 people comfortably, 6 if everyone agrees to keep their utensils between dinner and dessert. So I'm working up to the next dinner party. 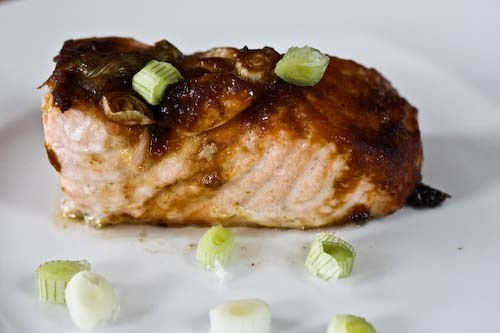 I hope to give you a better description once I use the book a bit more, but in the meantime, I tried this Red Miso Baked Salmon with Scallions. A little pouring, a few good whisks, and the sauce is spooned over the fish before it's baked. That's it. The fish comes out moist and the sauce beings to caramelize. The sauce that ended up next to the fish didn't fare as well, and couldn't really be spooned over. But it was supremely easy. I only used 4 fillets since it's just the two of us and I thought it would be nice for cold salmon leftovers. But I made the full amount of sauce. 6 salmon fillets, about 6 oz each. Oven preheated to 400F. Baking sheet lined with tinfoil with another sheet of tinfoil waiting. In a small bowl, whisk together the first 4 ingredients. Place the salmon on the baking sheet and spoon the sauce over each of them. Top with the scallions, cover with the extra sheet of foil, and bake for 15 minutes. Uncover and continue to bake for another 10 minutes, or until the fish is done the way you like it. Top with fresh scallions and serve. oh looks delicious and easy too. WOW ! That is easy. And it looks wonderful. I'm not normally a salmon fan, but this looks great! The color on the fish really makes me want to try it. I've been dying to try something with miso and this looks perfect. The book sounds terrific and your apartment sounds cozy and wonderful! I love salmon, especially wild salmon. It's just getting harder to get them. I like miso too, this is just simply delicious Andrea. Miso baked salmon is so quick and easy and good! It is one of my favorites! This is one recipe I'll use again and again. Thank-you! I love miso and salmon. I like all possible variations of this combo, with honey, maple, orange, ginger, soy, chilies, anything. It's just a winning pairing! You're version looks and sounds fantastic! Will try it next time! Works like a charm. Super fabulous dinner. Easy, outshines a restaurant any day. Im making this for easter in 2 hours.. Looks great...super healthy.. This year i am saying no to the traditional ham sonthat we can all emerge from the holiday feeling energized not guilty.. We ARE however going to enjoy dessert and yea, there will be chocolate cake!